Yoga therapists are a prolific bunch, partly because we often have been so changed by the practices ourselves that we want to find ways to share them with as many people as possible. These recent texts offer guidance for those wishing to incorporate yogic wisdom into their lives in a number of ways. This book first covers preparing for yoga, emphasizing up-front the importance of customizing the practices to one’s own needs. After the basic principles of practice, chapters in Part One include themes such as yoga for strength, flexibility, and balance. 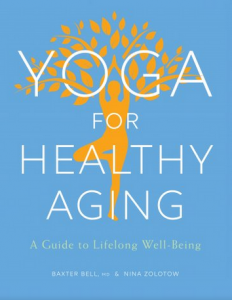 The effects of aging on each theme area, how yoga can help, and specific sequences for the theme are part of each chapter. Part Two offers details on the yoga poses from the previous section, clearly illustrated and described. Practitioners will appreciate the suggested pose modifications to match their abilities. This is a holistic self-help guide for people with eating disorders rather than a how-to for managing symptoms. The book is a step-by-step journey that assists readers to change their relationship to disordered eating through cultivating a self-compassionate attitude. 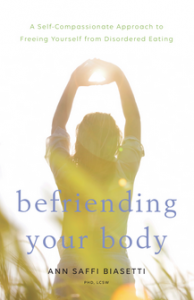 Although elements of yoga and mindfulness are included in the process of recovery and healing, this is not a yoga-focused book; it integrates mindfulness and mostly non–posture based yoga practices. Early in the book, Biasetti says, “You are not expected to feel self-compassion at this time.” She continues laying the groundwork for healing by noting that we don’t have to love ourselves before we can offer ourselves self-compassion. 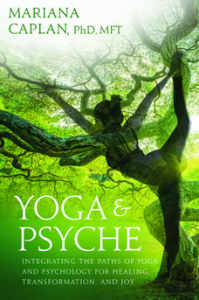 Geared to professionals, this informative book is a valuable addition to the growing intersection of the fields of yoga and psychology. Drawing on solid research, the text is illustrated with engaging stories informed by a wealth of personal and professional experience. It culminates with a clearly laid out Yoga & Psyche Method Toolbox applicable for yoga therapists, yoga teachers, psychologists, and/or other mind-body practitioners. Ayurveda is the sister science of yoga and one of the oldest systems of medicine still practiced. 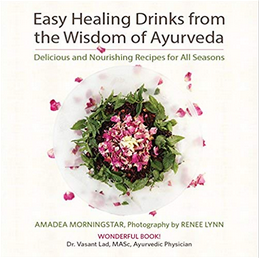 Alongside photographs and recipes for the title’s “easy drinks,” Morningstar teaches the key health-promoting principles of ayurveda—the three doshas (energetic constitutions), seven dhatus (tissues), three gunas (qualities), and four seasons. Easy-to-follow instructions enable readers to build on this information to customize the recipes according to individual needs. Full reviews of these books appeared in Yoga Therapy Today.